Should You Ever Change Your Book’s Cover? This is a very difficult question for authors, and for me specifically. I have no design eye. It’s why every wall in my house is painted “cream” or “off white” and our style of decoration is a touch above IKEA. To put some color in the house, I simply chose to add artwork, knick knacks and area rugs from the “fall hue family.” Meaning, if it’s an autumn gold, a deep green, a navy, a rustic red, or a mustard I’ve used it and hoped it all sort of meshed together. So, when I am posed with creating a cover for my books, I’m clueless. 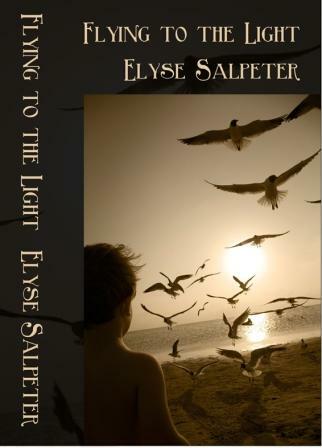 My first published novel, FLYING TO THE LIGHT, was published by Cool Well Press. 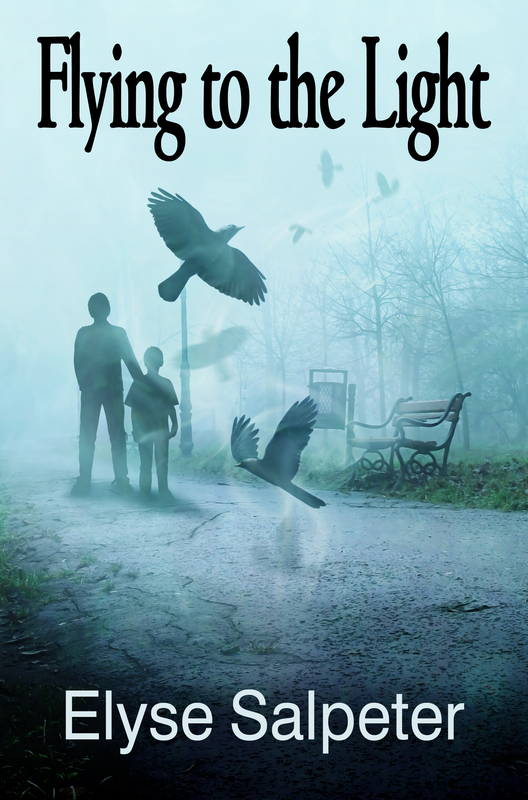 This was the cover they made for my novel about a young deaf boy who knows about the afterlife and now people are after him for the answer. It was dark, really just a few muted colors, but we loved the image of the little boy looking towards the light and the wonderful birds in the background. When that publishing company closed, I was given the book back. It was agented, but he couldn’t sell it. He suggested I change the cover and self publish it to get it back out to market. I sought out LLPix Photography and here’s what we came up with. We wanted something brighter… and to scream thriller, to show the relationship in the book between the two brothers and not just have it be about the little boy. And, to show that this book is still dark. I think the mood she created was really nice and spoke to that. I had polled a lot of readers on Facebook as to which cover they liked better. It was a very mixed review. Some folks who have already read book #1 liked that first cover, though they did feel it may have been too “religious looking.” Many new readers felt Cover #2 had a much better vibe. My problem is that I always want too much in a cover – the entire kitchen sink, so it’s important, for me, to seek out a professional who can scale me back. But, the going consensus in the industry is that your cover is EXTREMELY important. It is the first thing a potential reader sees and if you can’t grab them immediately, you’ve already lost them. If the book isn’t selling, and you are certain it’s a good book, it doesn’t hurt to try a new cover. So, which cover do you like? Would you pick up the blue cover or the dark cover if you saw both sitting on the shelf? Of course, before I do anything for book #2, I first have to make the cover! Don’t get me started on what I want in THIS one! Last week’s blog post about Getting Around Facebook’s Algorithms really seemed to help people. The most important thing to take away from that conversation was “engagement.” Like, comment, interact with people on Facebook. Don’t just smile and move on. If you see something you like, engage with it and you’ll pop up more on algorithms and start seeing more of the things you want to see. Problem: Why does it take hours for me to see my good friend’s post? Solution: This could be because you’ve selected Top Stories versus Most Recent on your news feed. In the top left of your screen (on a PC) You will see a running list of options: Under your profile/name, it will say News Feed. To the right of that you will see a little arrow. Click on the downward arrow and see if you’ve selected either Top Stories, or Most Recent. Top stories will mean you will get served more posts that OTHER people have liked and commented on. FB thinks these are “top/important” stories and will give you those. If you wish to see things a little closer to live time, hit recent stories. Issue, some friends say that they do hit recent stories, yet their friends and family still don’t see their posts often. Well guess what? Per my “inside friends who work with Facebook” it could be two things. A) Your friends also need to click recent stories as well as a selection. b) If you are not signed on, and occasionally sign in and out, that affects the algorithm timing as when things will pop up. It won’t just automatically do it – you’re in a queue (line) so to speak. One note of caution, sometimes FB will switch your selection from Most Recent back to Top Stories. I don’t know why, and it’s happened to a few people I know, and myself, so every now and then just check. Problem: Why do some Author Posts get more hits than others? Solution: Well, that depends. Last week we discussed why only a small % of our fans see our pages. That they must engage with our content in order to get served our posts more, and thus, why we need to boost our posts occasionally. I have another solution. Authors, go to your Fan page. On the top are bars and click on “See Insights.” Then scroll down and look at your last 5 posts. You can see the type of engagement you had for specific posts. Did you put in a link? Did you put in a picture? You can see the TYPE of activity your fans did. Did they like it? Did they comment? Did they share it? See below for an example. As you can see, when I boosted my post (in this case I targeted just my fans and their friends), you can see how many more people engaged and commented and the reach. I would suggest you try a few things… Don’t inundate your fans and space this up since you don’t want to be spammy, but how about post 2 covers and ask your fans which ones they like better? Another post, put in a blurb and link to your book, another post just do a regular post with no links or photos. Then do another one with just information about the book BUT now put the link in the comments section. Then, finally, boost a post. 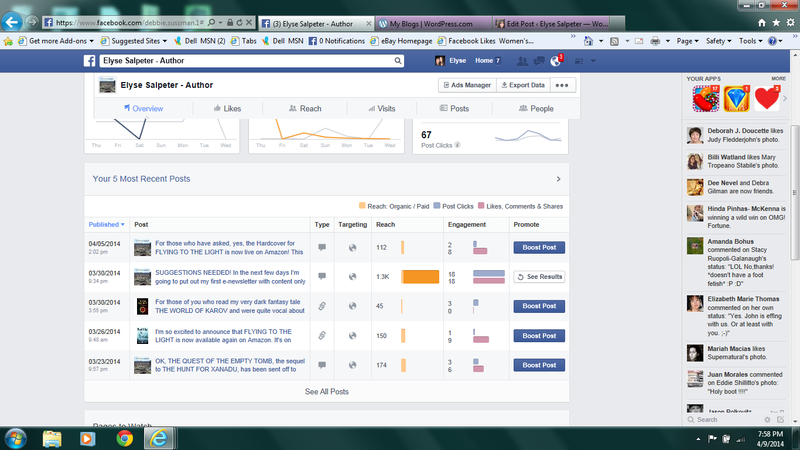 Then go back and look at this analysis page and see what worked and what got the most engagement. You’ll be surprised. I’ve found that most people will respond better to a photo and a question, then to a book link. Not to mention, Facebook seems to despise links to our books. For some reason I get much less awareness by FB to my fans when I do a link, versus do a photo. Facebook really doesn’t want authors to post links and drive people AWAY from the Facebook experience (hence, I suggest putting the link in the comments section). So, try these two tips out and see if they work! Love to hear some other ideas from everyone as well. Facebook – people seem to have either a love or hate relationship with it. They’re upset about the new layout changes, they’re upset at not seeing photos of loved ones, they’re disappointed their FB Fan pages are not being viewed by their fans. All of these disappointments are completely valid. Now let me help you get around them. Problem: You’re not seeing posts of your friends and family that you think you should be seeing. Solution: Facebook has built a model around “engagement.” They have decided that if you like or comment on people’s posts, you obviously are engaged with them. They also believe that certain friends on your friends list, who get a lot of comments, are people you would want to see more of because OTHER’s engage with them. As a result, they might show you these periphery friends because they think you might find them engaging as well. If you are not seeing some of your friend’s posts, your relative’s posts, there is a reason. You have not engaged them enough. Do you smile at their photos and posts and simply move on, without liking or commenting? Do these same people do the same thing to your posts? You’ll get a phone call later that “Oh yeah, I saw that but I didn’t respond.” My suggestion is to like every single thing they do and COMMENT on it. Yes, it’s a game and it sounds silly, annoying and time-consuming, but play it. Go to some friend’s/family pages right now and start liking and commenting. Facebook’s algorithm will ascertain these people are important to you. Not just because you’ve listed that they’re a close friend or relative (which does help when you click those options of delineation), but because they want to make sure, for certain, you like these people before they serve them to you time and again. Problem: Facebook Layout. It’s confusing. It’s busy. I liked the old way. Solution: Deal with it. They’re simply playing around with the experience to figure out how to honestly, get more ads in there in a way that’s not too intrusive, while still giving the user what they need. (remember, FB IS a business) Just note, the experience is also very different on Mobile, Tablet and PC. On the phone I see hardly anything, on the IPad it’s a bit better, and my best experience is on my laptop. Don’t expect the bells and whistles of FB if you’re just on your phone. Maybe you should check onto it on a computer now and again to get the full experience. It’s like your webpages – they look very different on a phone versus on a computer. Problem: People say you post too much. Solution: There’s a very good reason I try to post a lot. How will I ever know what will make people respond? Is it a photo? A link? A review of my book? Is it a great, goodwill video? A recipe I found? A person’s thoughts I’d like to share? We must continue to post often. If we don’t spam our readers with the same topic over and over, and continue to switch things up and be witty or informative, then folks shouldn’t have a problem. The important thing is to keep getting your name out there because the more people that respond, the more engagement and exposure we will have, and the more you will make it to the top of that algorithm. Problem: Facebook Fan Pages. Fans not seeing my posts. This is in my own craw, to be sure. How is it I have 1282 fans, yet only 4% of the people will see my post? Easy. Maybe my fans have not responded in the past. Maybe they’ve seen some of my posts, but because they have NOT engaged, they do not get served my posts as much, or as often, as other fans. Solution: Pay to Play. This is FB’s new model of business, because yes, it is a business. I suggest you boost a post and target it only to your fans and your fans friends. I do this for $5 and I jump up to 1200 views. Why is this important? Because now your fans will get served the post and if any of them like it or comment, guess what? You just got bumped up as being engaged with them. And if they like and comment, their friends will see it on their stream as well. I just boosted a post the other day after I saw only 2% of my fans had seen my post. Suddenly I saw fans like my post that I haven’t seen in months and months. You see, it’s not enough that someone is a fan, a close friend, a brother or sister. Facebook has no idea, nor cares, about anything but your interaction with these people. 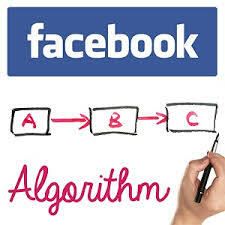 And you have the option for people you are not seeing, at any given moment, to go to their page and like and comment. In fact, every single fan, friend, and relative has the option at any moment to GO to your page to see your own posts whenever they wish as well. But most people won’t take the time and prefer to get “served.” By actually and forcibly engaging them, you become automatically top dog, front and center, where you wish to be. So I leave you with this: “Engagement is key.” You must play the game if you want the most out of your facebook experience. But one thing to note, folks. Please remember… Facebook is FREE. 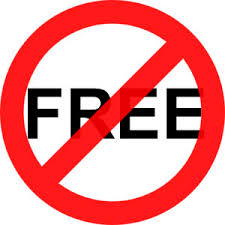 Authors, ever notice how mean people can be when you offer a FREE book? Ever think how opinionated someone is with a free book and they might start it and not even finish it? It’s like Facebook – it’s there, it’s free, but to get the most experience, you need to use it properly – just like a book – for the most experience, you need to finish the darn thing before you judge.